WNBC Anchor Jummy Olabanji goes behind the scenes at AileyCamp New York for an inside look on how the Alvin Ailey American Dance Theater continues to give back to the community. THE BRONX - The prestigious Alvin Ailey American Dance Theater's AileyCamp is celebrating its 30th anniversary. About 1,000 kids citywide are participating in the weekslong, free summer program to learn the art of different types of dance, including ballet, modern, jazz and West African. The kids will get to show off what they learned with a performance next month at the Hostos Center for the Arts & Culture. This year marks 60 years since the dance company was founded. 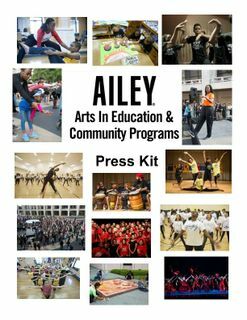 AileyCamp was the last foundation created by Ailey before his death in 1989. Organizers say the camp is made possible by funding through Children’s Aid. Tamara Best has long loved Alvin Ailey's dance company- and so she leapt at the opportunity to learn on of its seminal pieces on a sunny evening at New York's Lincoln Center. From ballet and tap to modern and jazz, Aileycamp offers classes for free. “AileyCamp gives them an opportunity to express themselves to a have a platform for creative expression," Nasha Thomas explained. The six-week program, in partnership with the Children’s Aid Society, is celebrating its 27th year in New York serving more than 100 students. The names Alvin Ailey and Atlanta Ballet are synonymous with great dancing, and once again this summer, Alvin Ailey American Dance Theater is teaming up with Atlanta Ballet to present an incredible opportunity to some young dancers. Master teacher and former Ailey dancer Nasha Thomas shared some of her dance moves with students from Bowie Elementary and Charles Drew Charter. The Alvin Ailey Revelations workshop took place at the High Museum of Art in Northeast Atlanta. The workshop is part of Ailey’s new program, Destination Dance. While the upbeat jazz of Duke Ellington played in the background, Alvin Ailey American Dance Theater instructors taught their choreography to a group of students Feb. 16 at Miami's Phillis Wheatley Elementary School.